Global finance ministers see rising trade tensions between the United States and China as a major threat facing the world economy. Argentine Treasury Minister Nicolas Dujovne says in addition to the shockwaves seen in markets from the threat of a trade war, finance officials are worried about potential geopolitical risks and also the impact that rising interest rates engineered by the Federal Reserve and other central banks could have on growth prospects. Dujovne said that G-20 officials discussed the risks during a dinner Thursday night with all participants agreeing that trade has been a positive force for many nations. Dujovne is the chairman of the G-20 finance group this year. Argentina will host a summit of world leaders later this year in Buenos Aires. German Finance Minister Olaf Scholz says Germany is committed to resisting all forms of protectionism’ at a time when tensions over trade have been rising and the United States and China seem on the brink of a trade war. In a statement prepared for a meeting of the IMF’s policy-making committee, Scholz said that a turn toward inward-looking policies and against free trade threatens common economic prospects. He said that trade has lifted millions of people out of poverty and protectionist measures will harm trade and growth. Scholz said the economy of the 19-country eurozone has gained momentum, driven by steady employment growth, increasing confidence of consumers and firms, improving investment conditions and a very accommodative monetary policy. 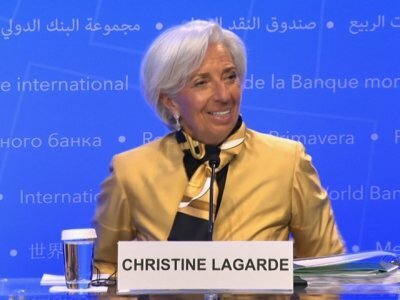 The head of the International Monetary Fund is urging countries to work out their differences over trade and take advantage of a healthy world economy to reduce debt before the next downturn comes. But clouds are already gathering: An intensifying standoff between the United States and China threatens to flare up into the biggest trade conflagration since World War II, and there are record levels of global debt. For now, the world economy appears to be nestled in a good place: The IMF forecasts 3.9 percent growth this year and next, the fastest since 2011, thanks to increasing investment and trade.